Vagrant is an open source tool for creating virtual machine configuration and provisioning utility such as VirtualBox, VMWare, KVM etc. With the help of Vagrant, a project organizer can easily setup a unified code running environment for every team member. Vagrant runs on AWS, Docker, and VMware too. But I am going to use VirtualBox in this tutorial. 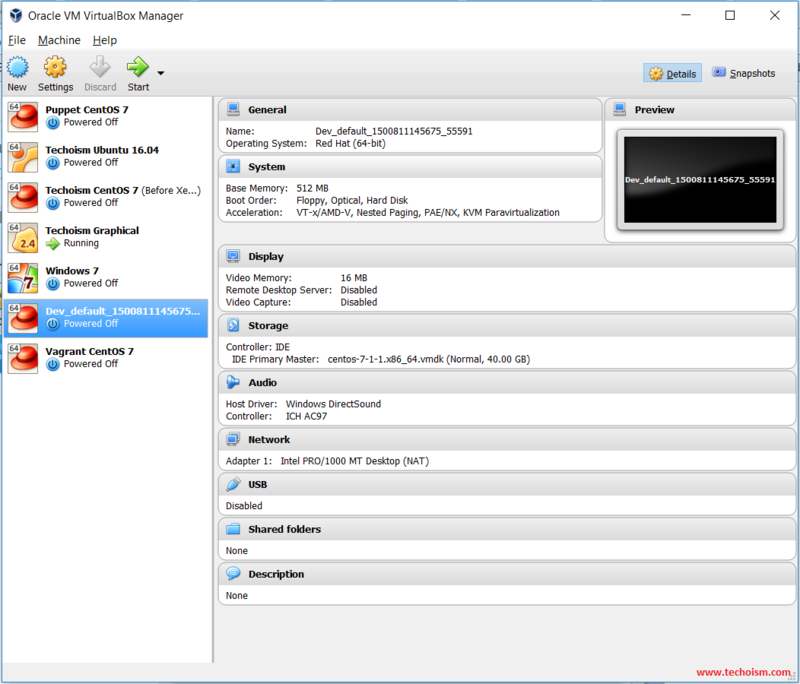 This article will help you to built new VM in VirtualBox using Vagrant. Before start installation of Vagrant we need to install VirtualBox because Vagrant use VirtualBox to install virtal machine. So first install VirtualBox on the server. First install all the dependencies required for VirtualBox. Now add the VirtualBox repository. Install the VirtualBox using yum command. Finally build VirtualBox Kernal Module. You need to download the Vagrant as per your system architecture. Right now 1.9.7 is the latest version of Vagrant. You can download the latest version of Vagrant from the official site. Download the RPM file as per you system architechture. Once downloaded complete, install the Vagrant using yum command. Now install the operating system for you project using below command. A Vagrant file will we created in the current working directory. This file contains all the configuration for Virtual Machine. The file name is Vagrantfile. If you want to built new operating system, then modify Vagrantfile file in your current directory. You can also configure you private IP using Vagrantfile file. Port forwarding using following changes. You can also define the vCPU and memory use by VirtualBox using following content. After done with your modification run below command. Let’s wait for the operating system built completely. It will not take much time because everything depends on your internet speed. You can check available pre-configured virtual machine from Vagrant office site. Managing virtual server using following command. Launch Virtualbox to see a built VM. You can login into the virtual machine using below command. Also If you are running Microsoft Windows, you need to use a third-party application in order to log in to the virtual machine. Here we are using putty application to access the machine. Download putty from putty official site.